Looking for a decent weed killer 2019? Then you're in the right place! Out of the different sprays we reviewed, we really liked the Doctor Kirchner Natural Weed Killer Spray and Sprayer because it's environmentally friendly and relatively non-toxic. The customer can choose between one of two sizes: gallon or two gallon tub. Each tub, regardless of size, comes with a spray nozzle attached to the container which is used to administer the solution onto the weeds. Another aspect about this product that puts it at the top of our list is that this weed killing spray is a snap to use. In addition, it can be sprayed on pesky, unsightly weeds without damaging beneficial foliage like regular grass and garden plants. Please remember that weed killing sprays are not effective 100% of the time, and some weeds might still grow after an application. Sometimes it is best to treat an area multiple times. Want to skip all this research and just hire a decent exterminator for your weed problems? What Is Weed Killing Spray? What Makes a Quality Weed Killer and Sprayer? Do Weed Killing Sprays and Sprayers Work? A weed killing spray is a product designed to eliminate pesky plants that can choke out flowers and grass. The sprayer itself is the device which allows people to spread the spray without having to handle it themselves or use a small bottle. Weed killers are herbicides, or chemical substances that eliminate unwanted plants from gardens, yards, and other areas. There are two types of herbicides out there that you should know about: selective and broad. A selective herbicide only kills targeted plants that are known to be nuisances, such as dandelions. Broad herbicides can destroy any plant they come in contact with. Most modern weed killers used today mimic natural plant hormones. In this case, the weed is stopped in its tracks and doesn't grow at all. There are a couple of different active ingredients that can be present in sprays. They are divided between pre-emergent and post-emergent efficacy—meaning that the ingredients will either work before the weed grows, or after. One of the most popular ingredients is glyphosate. It's non-selective and post-emergent, but also highly effective. It has the ability to kill desired plants like flowers, so it's best used as a spot treatment in gardens or driveways. Benefin is also common. It is selective, which means it only targets specific plants like weeds. It is also post-emergent and should be used on plants once they have started to grow. Most people use it as crabgrass control. Some people might also use natural plant oils like clove or lemongrass, or they might use vinegar. These ingredients work best on young weeds and as spot treatments since they aren't as strong as regular herbicides. There are a few different ways people can make their own weed killers, which are usually combinations of vinegar, plant oils, and salt. You can see for yourself in the video below how apple cider vinegar will cause weeds to wilt away within a day. While DIY project certainly might work, they are not as effective as FDA-tested and approved herbicides that come from stores. They also lack professional testing, which means they come with unknown risks. Vinegar, in particular, can kill flowers and beneficial plants alongside weeds. It's important to do some research before deciding whether to buy a spray or attempt to make one at home. In general, a spray sold in stores will be more effective and have clear safety rules and guidelines. What Are the Risks of Weed Killing Spray? Weed killing sprays should never come in contact with the skin or eyes. These liquids are also dangerous to inhale since they contain toxic ingredients. In general, all products should be used as directed and no more than that. People should wash their hands after spraying. In the event that herbicidal spray makes contact with your eyes, skin, or any part of your body, seek medical help immediately. Contact Poison Control in your area for advice or visit a hospital. You're probably wondering...what's the difference between a spray and a sprayer? While the spray is the actual liquid that kills the weeds, the sprayer is something different entirely. Garden sprayers are convenient external devices that control the amount of herbicide applied to plants. How Does a Sprayer Work? Not all sprayers are created equal. Sprayers can take a few different shapes: hose-end, tanks, or backpacks. Each one forces the liquid in the containment chamber to be pumped through a nozzle and applied around an area. Generally, the handle of the sprayer features of toggle which gives the user the ability to regulate how much liquid comes out. People can usually switch between a fine mist to a heavy spray. What Are the Risks of Using a Sprayer? Sprayers are actually a safe way to apply pesticides, because they limit skin and eye contact with the chemicals. However, it's easy for novices to accidentally apply too much herbicide since they don't have experience operating this kind of device. It's important to read the instructions before using any sprayer to minimize the risk of contact with chemicals. Another potential problem is called pesticide drift: when the sprayed chemicals boomerang back through the air towards the operator. People should avoid using a sprayer during windy days and always make sure they have proper eye, nose, and mouth protection. For more safety tips as well as helpful tidbits on how to use a garden sprayer, take a quick glance at the video below. As with any other product you'd spend your hard-earned cash on, you want to make sure you're getting quality stuff. Top-notch weed killers and sprayers are ones that work, period. No one wants to buy a fancy device and solution if neither one is effective. When choosing any kind of weed-killing assistant, your first step should be to check the label and see if it works on the type of plants you're targeting. How Much Does Spray Cost? Sprays are generally sold in two standard denominations: per ounce or by the gallon. Of course, if you're only spot-treating a small area, purchasing the smaller containing is a better buy than a large gallon tub. However, the gallon containers will generally be cheaper by volume, as they're sold at more of a wholesale deal price. If it's worth it to upgrade to a large container, it might actually save you money in the long run and be more economically sound to bite the bullet and make the larger upfront purchase. For up-to-date prices on weed-killing sprays, check out our buying guide with prices listed below. How Much Does a Garden Sprayer Cost? Sprayers themselves are usually inexpensive. A simple model is usually comes along with a modest price tag—depending on the style and whether or not it comes attached to a container of spray. Also, here's a quick tip to keep in mind: you'll be able to use a garden sprayer again for other tasks in the future. 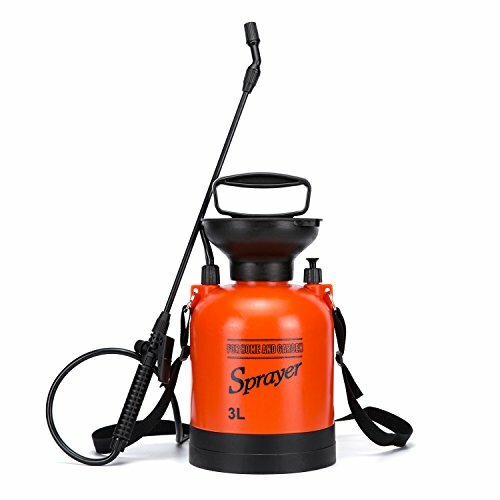 For example, if you ever need to spray for wasps, hornets, yellow jackets, or any other flying pest, this type of garden sprayer is exactly what you need to get the job done. To see an accurate and to-the-minute listing of prices, take a look at our buying guide below. As with many chemicals, the sprays will usually work but aren't always 100% effective. More often than not, it takes some experimentation to find the right one, but any kind should kill some of the weeds cluttering up the yard. Garden sprayers are highly effective due to their simple, streamlined designs. In fact, you'll be hard-pressed to break a sprayer without damaging the nozzle in some way! Want to skip all this research and just hire a decent exterminator for your weed problem? The Doctor Kirchner Natural Weed Killer is one of the only pet- and kid-friendly herbicides available on the professional market. Its primary ingredient is vinegar, which helps it kill common broadleaf menaces like dandelions. In addition, the product is bee friendly and biodegradable. This spray is offered by the manufacturer in a variety of sizes, including the most popular size: 2.5 gallons. As an added bonus, The Doctor Kirchner Natural Weed Killer does have an attached sprayer for easy use straightaway. The natural weed killer doesn't hurt other beneficial plants such as roses or regular grass. It can be reapplied as often as needed, and a gallon covers a large surface area. We endorse this product to people who want to avoid the traditional chemicals in herbicides and are willing to invest a little more money to keep pets and kids safe from accidents. 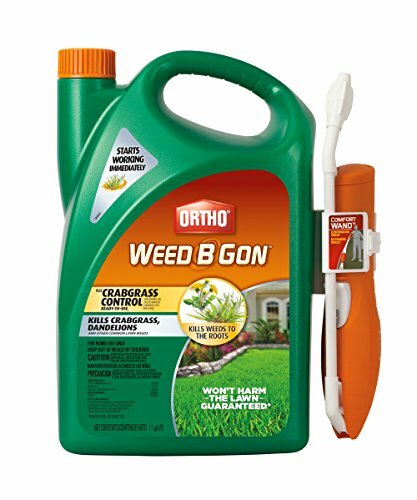 Ortho Weed B Gon MAX is a tough herbicide designed to kill all kinds of common weeds, including crabgrass and dandelions. The manufacturer claims it works on over 200 types of unwanted plants. This product is sold in several different sizes, including a full gallon container with an attached wand. The wand can be used to spray herbicide in hard-to-reach areas easily. Ortho Weed B Gon does not hurt most grass types. The spray becomes waterproof in an hour, and most users report that they see progress after only a single treatment. We recommend this product to people who have lawns frequently choked with weeds since it works well in grass and targets dandelions, chickweed, crabgrass, and painful thistles. 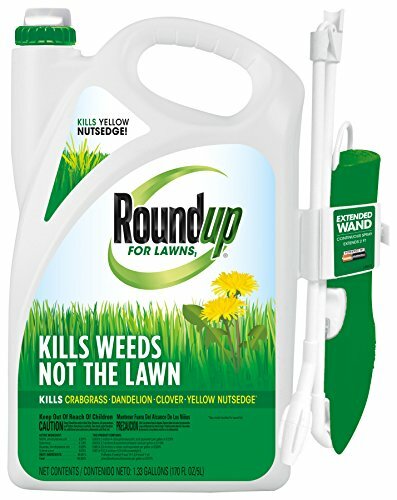 Roundup could be considered one of the most well-known weed killers in the United States. This renowned brand uses a tough formula designed to get rid of most weeds, including clover, dandelions, and strong crabgrass. People can purchase this product in gallon jugs for an affordable price (when stacked against the going rate for competitors' products). This spray comes with an attached sprayer, and users can expect to see results in less than 3 hours. The formula becomes rainproof within just 10 minutes. In addition, this spray doesn't need to be reapplied often because it creates a weed-proof barrier for up to 12 months after a single use. We recommend this product to individuals who don't have time to re-spray weeds and aren't scared off by a strong formula. 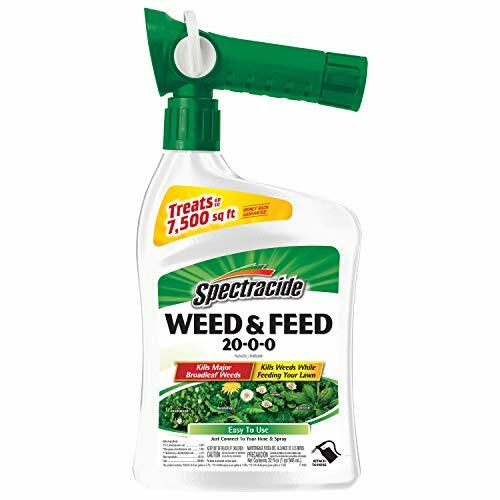 The Spectracide Weed & Feed 20-0-0 is a combination herbicide and sprayer designed to target broadleaf weeds. This means it works on poison ivy, poison oak, dandelions, clover, and more. Each container comes with an adjustable nozzle that can be used to spray weeds without touching the herbicide itself. A reason we really like this nozzle in particular: as a safety precaution, it switches between an on and off position. For those with little ones roaming around, this seemingly small aspect is a huge advantage. One container of this Spectracide should treat up to 7,500 sq. ft. and has the added benefit of providing extra nutrients for valued grasses. A single bottle is much less expensive than the asking price of the competitors on the market. 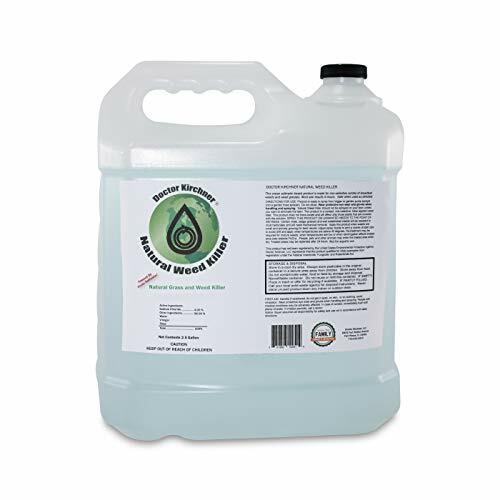 We recommend this product to people who have large lawns that struggle with broadleaf weeds and would like an affordable alternative to other herbicides. Unlike other products in this review, the CANCA Garden Sprayer is just a sprayer and doesn't come with a specific herbicide. Instead, users can choose what type they prefer and pour it into the easy to open containment chamber of the CANCA. The product holds 3 liters of weed killer. It comes with a long wand that provides extra reach so users don't need to do a lot of back-breaking bending to work in their garden. Each containment chamber has extra O-rings to keep the herbicide safely inside. It's air-tight and made of non-corrosive material to prevent leaks over time. We recommend this product to individuals who might need to treat different weeds around their yard or want the comfort of a sprayer that can sit securely on someone's back. People will have different needs when it comes to weeds, since they annoy some individuals more than others. Curious about other ground weed related products? Check out our other detailed guides to help you deal with your pest problems.